The answer is it might be if its not properly fastened in place. Say what now? I didn’t know my range needed to be fastened in place. Unfortunately, in most cases neither did the installer. Anti-Tip brackets come with every range but most are thrown away without being installed. But don’t worry if your range doesn’t have them, it’s a simple fix. this can be done without much trouble by installing an ‘anti-tip’ bracket behind the range. Often times your home inspector will check to see if one is installed. Below is a picture of a typical slide in range anti-tip bracket. WHAT IS AN “ANTI-TIP” BRACKET ANYWAY? An anti-tip bracket is a small clip that attaches to the wall or floor behind the range and prevents it from tipping over. According to the Consumer Product Safety Commission (CPSC) there were around 38 fatalities associated with ranges tipping over in the years between 1980 and 2008, and far more injuries in addition to that number. The fatalities were divided among children between one and 5 years old and elderly adults using the open range door for support. 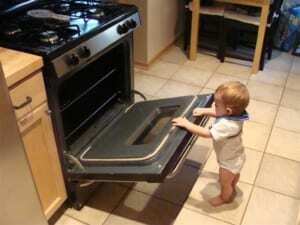 If the range tilts forward and hot water or oil falls onto a child it could be a disaster. One of my friends had this happen to him with bacon grease and I don’t want to see it happen to anyone else. In response to this danger, the American National Standards Institute (ANSI) and Underwriters Laboratories (UL) created standards in 1991 that require all ranges manufactured after that year to be capable of remaining stable while supporting 250 pounds of weight on their open doors. Manufacturers’ instructions, too, require that anti-tip brackets provided be installed. IS AN “ANTI-TIP” BRACKET REQUIRED? 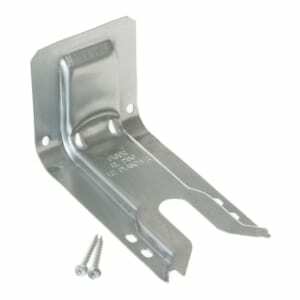 While anti-tip brackets are not referenced directly in the building code they are required by the manufacturer. The building code states “General. Equipment and appliances shall be installed as required by the terms of their approval, in accordance with the conditions of the listing, the manufacturer’s installation instructions and this code”. In other words if the manufacturer has recommended it as part of their installation then it must be installed. HOW DO I KNOW IF ONE IS INSTALLED ON MY RANGE? You might be able to see the bracket by looking behind the range with a flashlight, but some floor mounted brackets are hard to see from this angle. Some ranges have removable drawers or as space between the range and the floor that will make it possible to see if one is installed. The other way to test if one is installed is to carefully tip the range forward. It will only tip forward slightly if the range is properly secured in place. Make sure to remove everything from on top and inside the range before you attempt this. There are many different types of ranges, but as far as I know all of them require an anti-tip bracket. Different ranges have different brackets so look for one by make and model number of your range. I DON’T HAVE ONE – WHAT SHOULD I DO NOW? Anti-tip brackets are available from the manufacturer, big box stores, online and sometimes at appliance stores. They only cost a few dollars and simply get screwed in place. The range does need to be moved out of the way to do this, so make sure if you are doing this yourself you have an assistant and also make sure to protect your floors from damage because stoves are heavy and can easily damage wood floors. https://d3bfc4j9p6ef23.cloudfront.net/wp-content/uploads/sites/57/2018/12/27193435/Anti-Tip.jpg 225 295 alansinger https://d3bfc4j9p6ef23.cloudfront.net/wp-content/uploads/sites/57/2018/11/07195401/logodark.png alansinger2018-12-27 17:45:312018-12-27 19:38:32Is My Range In Danger Of Tipping Over?